..the most successful of all women announcers – her personality is a combination of dignity and friendliness. There had been female announcers on the Third from the very beginning – Marjorie Anderson, and also Joy Worth, who had a lovely, slightly ‘ginny’ voice. You’ve got to be a very special woman to have a good broadcasting voice – the male voice is, normally, much harder and clearer. I brought Patricia [Hughes] back after her maternity absence. Later I brought in Elaine Padmore and Susan Sharpe. Rigby recalls that Stephen Hearst [controller Radio 3 1973-78] did not initially share his enthusiasm for Patricia Hughes: ‘He took me out to lunch, and we were talking about reducing the starch in the network, and Stephen said: “My dear Cormac, you have to get rid of that terrible woman with the Kensington voice.” And I realised he meant Patricia, who was the most popular individual member of my announcing team, and I said, “You must be joking.” He wasn’t, but he was always a big enough man to rethink his own prejudices.’ Hearst himself confirms he soon came to admire her greatly. Patricia Hughes is seated in centre front in the header photo. 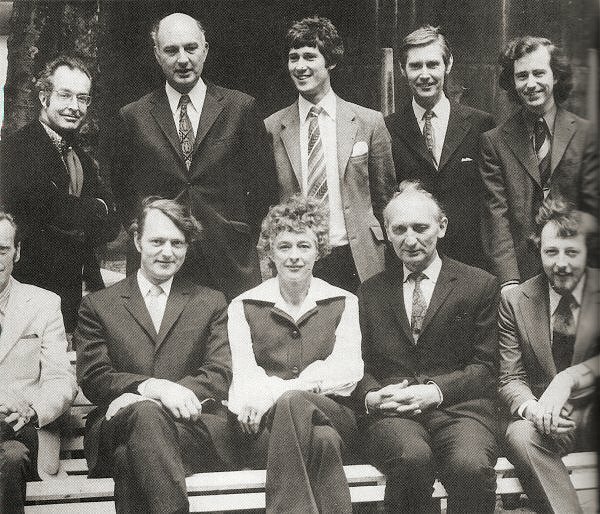 Readers who remember the days when BBC Radio 3 really was the envy of the world will also recognize from left to right standing, Jon Curle, Victor Hallam, Tony Scotland, Donald Price, Cormac Rigby, and seated left to right, Tom Crowe, Peter Barker, PH, Robin Holmes and Norman McLeod. There is a nice Tom Crowe story here.